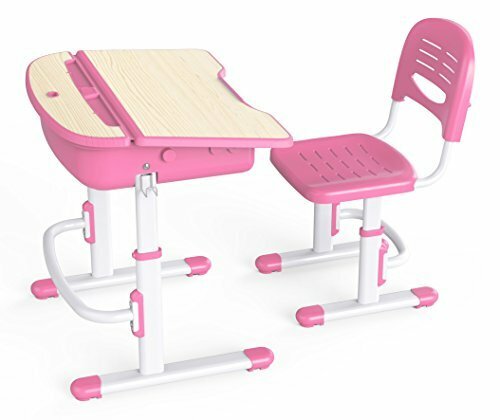 Children's Ergonomic Desk & Chair Set. This ergonomic desk and chair set has been specially designed to help children adopt proper posture when seated. Ideal for kids' rooms, study areas, and playrooms. They are ergonomically conceived to ensure correct posture and promote healthy learning. It is recommended to adjust the work position often. Give your child the perfect place to write, draw, and study. The rounded corners and soft edges make it safe and the fun colours make it the perfect addition to any child's room. The adjustable features allow it to grow with your child. The desk offers a storage compartment inside for all your child's supplies and easy-to-clean laminate surface which will remain attractive and functional for years to come. Comes with small book holder and schoolbag hook. This product is recommended for ages 3-12. The desk height can be adjusted between 53 cm and 76 cm (21 in. to 30 in.) and the chair seat height can be adjusted between 30.5 cm and 47 cm (12 in to 18.5 in).